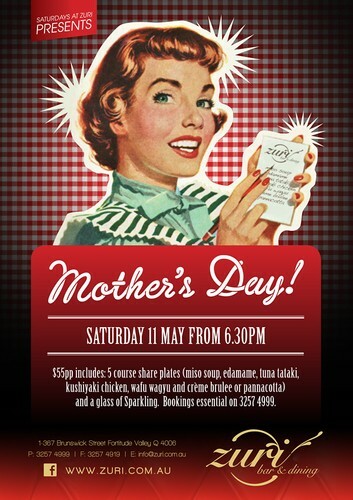 Forget pyjamas, homemade cards and breakfast in bed this Mother’s Day, and treat Mum to a unique and beautiful experience at Zuri Bar in Brisbane’s Fortitude Valley on Saturday 11 May. Mums will be celebrated in opulent style in the baroque-inspired venue, only a short walk from the Brunswick Street Mall. Mum will revel in the chance to dress up, enjoy freshly prepared Japanese style share plates and sink into one of Zuri’s elegant lounges with a cocktail, champagne or glass of sparkling. Secure your place at Zuri Bar for a special night out with Mum. Receive five course share plates including miso soup, edamame, tuna tataki, kushiyaki chicken, wafu wagyu and crème brulee or pannacotta with a glass of sparkling for only $55 per person. Bookings are essential on 07 3257 4999.